Three Red Wolf pups were born at the Great Plains Zoo, the Zoo announced today. Red Wolves are a critically endangered species. The pups, all female, were born to mother “Ayasha” and father “Nayati” on April 10 and are now starting to make their first outdoor appearances. The pups weighed less than a pound at birth and have grown to approximately six pounds each. The Zoo’s animal care staff monitored the birth through video cameras and continues to observe the new family. This is the third litter for mother Ayasha but the first for the pair. Just like human newborns, the pups currently spend much of their time sleeping, eating and bonding with their family. The pups can now choose to be on exhibit, viewable by the public, at any time. The pups’ father, Nayati, can be seen daily in the Red Wolf exhibit. Red Wolves were once common throughout the eastern and south central United States, but by the early 1900s, Red Wolf populations had fallen victim to predator control programs and habitat destruction. In 1980, they were declared extinct in the wild by the U.S. Fish and Wildlife Service and the remaining individuals were brought into captivity in an effort to preserve the species. Thanks to zoos working together through the Association of Zoos & Aquarium’s (AZA) endangered species breeding program, Red Wolves were brought back from the brink of extinction and were eventually reintroduced into the wild. Today, about 100 Red Wolves roam their native habitats in eastern North Carolina. The Great Plains Zoo has been a successful contributor to the AZA’s endangered species breeding program, breeding Red Wolves since 1993. The Great Plains Zoo and Delbridge Museum of Natural History is open Monday through Saturday from 9 a.m. to 4 p.m. and Sunday from 11 a.m. to 5 p.m. with the last admission at 4 p.m. each day. Visit the Zoo online at http://www.greatzoo.org or call 605-367-7003 for more information about the Zoo and Museum. Frustrations about the way the Idaho Department of Fish and Game is managing the state’s wolf population ran high Monday in Coeur d’Alene. Many turned out to testify at a public hearing the state’s Fish and Game Commission held during its meeting taking place Monday and today in the Lake City. Some of the loudest complaints were from people upset about the use of taxpayer dollars to fund the commission’s Wolf Depredation Control Board. They claimed Fish and Game’s focus is on pleasing hunters and sportsmen instead of doing what is best for wildlife habitat. Last year and again this year, the Legislature allocated $400,000 from the general fund to the Wolf Depredation Control Board. and up to $110,000 from Fish and Game that is matched by Idaho’s livestock industry. In total, the control board can receive up to $620,000 each year to use for “control actions against wolves when there is a depredation conflict between wolves and wildlife or between wolves and livestock” according to section 22-5301 of the Idaho Code. Almost all who testified at the hearing urged the commission to suggest the Wolf Depredation Control Board return taxpayer dollars to be used in a better way or to stop killing wolves completely. 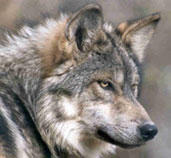 LAS CRUCES – In an effort to thwart the New Mexico Department of Game and Fish, the United States Fish and Wildlife Service (USFWS) removed the department’s application to temporarily halt future Mexican wolf releases into New Mexico from state to federal court late Friday. The department’s application alleges the U.S. Fish and Wildlife Service (USFWS) ignored state and federal laws last month by importing and releasing two Mexican wolves without first obtaining required state permits. Under New Mexico law, the importation and release of non-domesticated animals requires a permit from the department and federal law instructs the USFWS to consult with the states and obtain necessary permits before releasing wildlife. The department originally filed the application in the state’s 7th Judicial District Court. It has since been moved to the U.S. District Court in Las Cruces. Commentary: The Southwest Environmental Center blasted the New Mexico Department of Game and Fish (NMDGF) for trying to block releases of endangered Mexican wolves into the state. NMDGF announced today that it was seeking a temporary restraining order to prevent the U.S. Fish and Wildlife Service (FWS) from releasing more wolves. Bixby noted that New Mexico officials under Governor Susana Martinez’ administration have consistently opposed Mexican wolf recovery. The state withdrew from participating as a partner in the recovery program in 2011 shortly after Martinez was elected. NMDGF and the NM Game Commission—whose seven members were appointed by Martinez—then abruptly denied permits that had routinely been issued in the past to FWS and Ted Turner’s Ladder Ranch to import and release wolves in the state. More recently, Martinez joined neighboring states’ governors in sending a letter to federal officials stating their opposition to allowing Mexican wolves to expand into areas that biologists say are essential to their recovery. Bixby also noted that Mexican wolves are protected as a state endangered species under the New Mexico Wildlife Conservation Act (WCA). “Rather than wasting tax dollars trying to prevent federal officials from doing the right thing, NMDGF should do its job and get busy helping to restore wolves, as it is required to do under state law,” he said. The WCA requires that NMDGF develop recovery plans for species listed as threatened or endangered under the act, something the department has never done for Mexican wolves. Biologists say that releases of more wolves into the wild from the captive population is the only way to reverse a decline in the genetic health of the wild Mexican wolf population. They say releases are urgently needed to restore genetic variation and prevent Mexican wolves from going extinct in the wild. The window for making these releases to carry out a “genetic rescue” of Mexican wolves is limited. The FWS recently placed two captive-born wolf pups, selected for their genetic makeup, with a wild litter in the Gila National Forest in a process known as cross-fostering. NMDGF argues that FWS needs to finish revising its Mexican wolf recovery plan before going forward with releases, which FWS has committed to do by the end of 2017 as part of a court settlement. NMDGF is being disingenuous when it says that a recovery plan needs to be completed before more releases can take place. Recovery planning is important, but not the highest priority. With only about 97 Mexican wolves in the wild of NM and Arizona, and less than 25 in Mexico, the “lobo” is one of the most endangered canids on the planet. The Southwest Environmental Center works to protect and restore wildlife and their habitats in the Southwest. A Washington Department of Fish and Wildlife photo shows a member of the Teanaway wolf pack. Some state and local officials want the department to share wolf tracking data with ranchers during denning season. The Endangered Wolf Center in St. Louis, Mo. collaborated with the U S Fish and Wildlife Service to fly two newborn Mexican Gray Wolf pups from the Center in St. Louis to gray wolf territory in New Mexico. The pups were born April 15, 2016 in St. Louis and given the names Lindbergh (mp1461) after the famous aviator and Vida (fp1462). Placing captive born Mexican wolves into a den of wild wolves has never been tried before, and marks the first time for the cross-fostering of Mexican Gray Wolves. Under the care of Regina Mossetti (Director of Care and Conservation at EWC) and Emma Miller of the Endangered Wolf Center, the pups were flown safe, warm and sound to New Mexico. The wolf pups were released into the den of the “Sheepherders Baseball Park” Pack in the wolves’ territory in Cantron County, New Mexico. The new wild father of the pups is M1284 (collared) and the mom is M1392, who already had her own litter of five pups. The adoption of captive wolf pups into a wild pack is a careful undertaking as the wolf pups from both the captive and wild mates should not be more than a few days apart in age. The transfer of the pups from captivity to wild should, in general, take place before the pups are ten days old. These challenging requirements make for even more challenging logistics of a known wild wolf den, timing, weather, terrain and travel. If the trial fostering induced by the USFWS proves to be a successful adoption by the wild mated pair of Mexican Gray Wolves of the SBP pack, it will provide a boost to the whole of the wild population of Mexican Gray Wolves as well as much needed genetic diversity to the less than 100 (97 in 2016) wolves currently in the wild. 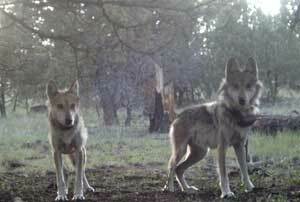 According to the last count, 47 of the 97 are found in New Mexico, mostly in the Gila National Forest.